MINT: "Why It's Impossible Not to Be Political"
"Why It's Impossible Not to Be Political"
To say that 2016 has politically speaking been a rather terrible year would be the greatest understatements of them all. For many reasons, the music scene is of course not exempt from what’s happening in the political sphere. From the mainstream to the underground, many artists use their platforms to make their voices heard – while others offer means of escaping the misery for a few minutes. The MINT collective have always had a political approach to their event series at clubs like Berlin’s ://about:blank and have taken things a little bit further before their last party at Prince Charles with a panel discussion ranging from the personal to the political – and everything in between. 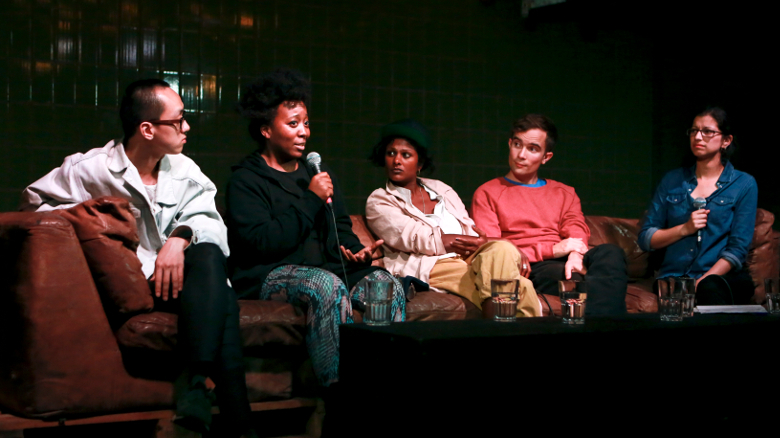 Under the title “The Artist’s Role in Todays Society: Why It’s Impossible Not to Be Political”, the musician and arts educator Shanti Suki Osman moderated a talk hosted by MINT in collaboration with the record label Reveller and Reclaim The Beats. Along Reveller’s founder, the DJ and producer Sky Deep, it featured the Chinese-born performing artist and producer RUI as well as The Knife’s Olof Dreijer and the vocalist and songwriter Perera Elsewhere. Watch the whole panel discussion below. The Only Good System Is A Sound System 2019: Tickets zu verlosen!